What personal information does ExploringMacedonia.com gather from me and how is this information used? When browsing our site, you are not required to provide any personal information unless and until you choose to make a purchase or sign up for one of our e-mail newsletters or other services as described below. We do not knowingly permit the site to be used by any person under the age of eighteen and we do not knowingly collect any personal information from children (meaning those younger than thirteen years of age). A valid credit card is required to make a purchase on our site. In order to purchase travel and related services through our site, you must provide us with certain personal information such as your name, your credit card number and expiration date, your credit card billing address, your telephone number, your e-mail address and the name or names of the person(s) traveling (if not you). We require this information so that we can process, fulfill and confirm your reservations and transactions and keep you informed of each transaction's status. If you are making a reservation for one or more travelers other than yourself, you will need to make sure that each of these other travelers agrees, in advance, that you may disclose their personal information to us. For your convenience, we make certain information about your reservation available to you or other persons authorized by you to receive such information. If you choose to become a registered member of ExploringMacedonia.com, you must provide your name, address, telephone number, e-mail address, a unique login name, password, and password validation, and a password hint to help you remember your password. This information is collected on the registration form for several reasons including: (i) personal identification; (ii) to complete hotel, car, and other reservations; (iii) to allow us to contact you for customer service purposes, if necessary; (iv) to customize the content of our site to meet your specific needs; and (v) to make product improvements to our site. In addition, we need your e-mail address to confirm your new member registration and each reservation you transact on our site. ExploringMacedonia.com values opinions and comments from members, so we frequently conduct online surveys. Participation in these surveys is entirely optional. 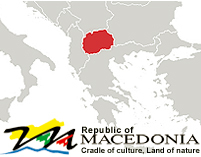 Typically, the information is aggregated and used to make improvements to ExploringMacedonia.com and to develop appealing content, features and promotions for members. Survey participants are anonymous unless otherwise stated in the survey. We automatically log generic information about your computer's connection to the Internet, which we call "session data".. Session data consists of things such as IP address, operating system and type of browser software being used and the activities conducted by the user while on our site. An IP address is a number that lets computers attached to the Internet, such as our web servers, know where to send data back to the user, such as the pages of the site the user wishes to view. We collect session data because it helps us analyze such things as what items visitors are likely to click on most, the way visitors are clicking through the site, how many visitors are surfing to various pages on the site, how long visitors to the site are staying and how often they are visiting. It also helps us diagnose problems with our servers and lets us better administer our systems. It is possible to determine from an IP address a visitor's Internet Service Provider (ISP) and the approximate geographic location of his or her point of connectivity. We may also use some session data, such as the pages you visited on our site, to send you e-mail messages (such as "Suggested offers") focused on destinations that you may be interested in, unless you had previously opted out of receiving such messages. First and foremost, you can rest assured that no personal information about you is gathered or stored in the cookies placed by the ExploringMacedonia.com.com web site and, as a result, none can be passed on to any third parties. None of this information is passed to any third party and is used solely by us to provide you with a better user experience on our web site. No personal information about you is gathered through the use of these types of cookies. Most web browsers automatically accept cookies. Of course, by changing the options on your web browser or using certain software programs, you can control how and whether cookies will be accepted by your browser. ExploringMacedonia.com supports your right to block any unwanted Internet activity, especially that of unscrupulous websites. However, blocking ExploringMacedonia.com cookies may disable certain features on our site and may make it impossible to purchase or use certain services available on the site. Please note that it is possible to block cookie activity from certain web sites while permitting cookies from sites you trust, like ExploringMacedonia.com. Can I ask to access, change or remove my personal information stored at your premises? According to the Data Protection Law of R. Macedonia, Article 10, 12 and 14 you can ask to access, change or remove any personal data that you have provided to us. Please read the policy regarding this topic that can be found on the following link: and fill in the form provided if you wish to practice your right. Please send us the form using the contact information at the bottom of this page.